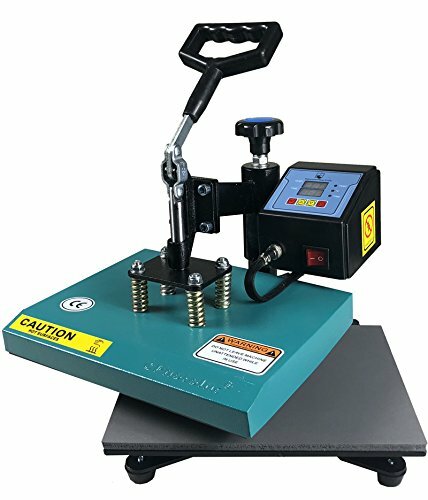 ePhotoInc® T Shirt Heat Press Machine 9" x 12" allows transfers graphic T-shirts, garments, bags, mouse mats, jigsaw puzzles, ceramic tiles, plates and other flat surfaced items. Easy to use - Arrives fully assembled and ready to use out of the box. Heat Press Machine is equipped with latest digital Led Temperature and Time Display Controller. Temp: room temp to 500F, Time: 0-999s. When the timer reach 0s an audible sound will alarm this will avoid over heating you projects. Top mounted Pressure knob allows easy access to adjust pressure according to the thickness of the material you are working on. The heating element is Teflon coated - none stick surface will preventing scorching of transfers, and does not require a separate silicone / teflon sheet. * Printing Area: 9" x 12"
* Packing Size: 18" x 14" x 14"